This 6 nights and 7 days heritage tea trail tour is a pleasurable retreat for tired souls. Assam heritage tea trail tours are known for their unending vistas of tea plantation which look beautiful. We offer customized heritage tea trail tours in Assam to let everyone enjoy a holiday that fits their budget and time schedule. Book your heritage tea trail tour India with us to have a whale of a time amidst beautiful aromas of tea. Our heritage tea trail tour packages also remain popular among newlyweds looking for a place away from glitz and glamour of the outside world. Life in Assam’s tea gardens is wonderful. For the wearied traveller,a brief sojourn in a lush green tea plantation is a novel experience. Tea plantations in Upper Assam can be best experienced in and around Dibrugarh. Watching the tea pluckers at work, one would only marvel and admire the deftness of their fingers as they pluck the delicate two leaves and a bud. Received at the airport and transferred to a Heritage Chang Bungalow. In the afternoon, take an introductory tea walk. In the evening, enjoy a Bihu dance (an Assamese Folk Dance) on the Bungalow lawn. Overnight at the Chang Bungalow.Dibrugarh is the gateway to the “Hidden Land” of Eastern Arunachal Pradesh. The Ahoms from Thailand came through Northern Myanmar through this area in the 13th century to establish their Empire which thrived in the ancient land of Assam. It is the “Camellia” town of Upper Assam, an undisturbed haven, with its rich tea gardens resembling a lush green carpet. Experience and enjoy the richness of these tea gardens while staying at the Heritage Chang Bungalows. These are constructed on stilts and are situated in a serene atmosphere free from pollution.When the British established their tea plantations in the mid-19th century they quickly built comfortable bungalows designed to make life as pleasant as possible in what, was to them, a hostile and strange land. One of the main features of these buildings has given rise to their name – Chang bungalows. Chang in the local language means “raised on stilts” and the design served multi purposes; to keep the house cool by allowing the breeze to blow underneath and to keep both water and animals out! Bihu is the most popular folk dance of Assam. The people of Assam are very proud of its unique position among all other such dances of India. ‘Bihu’ performed by young men and women reflect youthful passions and joys rejuvenating life during the spring season, accompanied by songs woven around the theme of love and physical yearning. Go for a tour of a tea garden to know the origin and the history of tea - how it is grown, all about tea tasting and its quality. 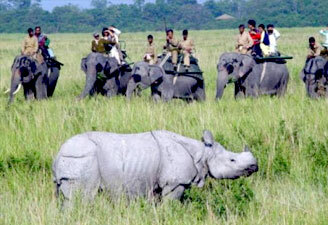 In the afternoon -take a nature walk in a natural protected forest area or visit an ethnic Assamese village or option to go for a boat cruise in a country boat on the might Brahmaputra River where there is a possibility of sighting Gangetic river dolphins and migratory birds on the vast expanses of grasslands. Overnight at the Chang Bungalow. A tea tour through a 157 years old heritage tea garden gives an insight into the different activities that vary from season to season. It teaches us all about tea- its origin, how it is grown, tea tasting and its quality. During the winter months the dormant bushes are pruned to ensure vigorous growth during the warmer months. Once the rains begin, and the temperature rises, the gardens come alive with teams of colourfully dressed tea pluckers, predominantly ladies as they are said to be better able to pluck the delicate buds and leaves. The harvest, which goes continuously from March to November, is taken everyday to the factory where it undergoes an age-old process of being turned into the finished product. All stages of the process are carefully controlled to ensure that the tea that leaves the factory is only of the highest quality, a quality that has made Assam tea world famous. 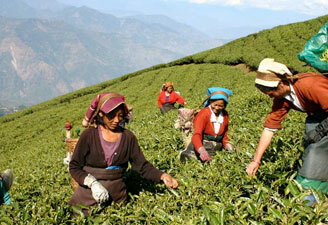 N.B: - Tea factories are functional from March to December only. Early morning drive to Guijan range of Dibru-Saikhowa National Park (50kms/1.5hrs) – a riverine park and a biodiversity hotspot situated on the southern bank of the river Brahmaputra. 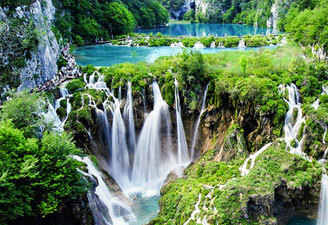 Explore the park in a country boat or trek inside the park. Return to Dibrugarh late in the afternoon. In the evening- enjoy a Jhumur dance performance by the tea tribes on the Bungalow lawn. Overnight at the Chang Bungalo.Dibru-Saikhowa National Park has the most distinct and vibrant wildlife. This park got its status as a national park in 1999 only. The forest in this park ranges from semi-evergreen to deciduous to littoral to swampy marshes with patches of semi- evergreen jungles. About 36 species of mammals have so far been recorded in Dibru-Saikhowa National Park – Royal Bengal Tiger, Leopard, Clouded Leopard, Jungle Cat, Sloth Bear, Malayan Giant Squirrel, Slow Loris are some to name a few. Dibru-Saikhowa is a safe haven to many rare and endangered species of birdlife. We take boat rides and walks around parts of the park’s southern fringes. We will be able to see the White Winged Wood Duck, Bengal Florican, Great Indian Hornbill, Greater Adjutant Stork, Pallas’s Fish Eagle, Greater Spotted Eagle, Swamp Fran Colin, Swamp Prynia and Marsh Babbler.Jhumur dance is generally performed by the tea-tribes. In the passage of more than a hundred years of their settlement in Assam, the tea-tribes have developed a synthesized form of dance. This dance is performed by both girls and boys together, and some times by the girls only with a precision of footwork while clasping each others waist. The Jhumur dance is replete with enchanting descriptions of the beauty of nature and expresses emotions like love, sorrow and joy. Overnight at the Chang Bungalow. Drive on to Kaziranga National Park (220km/5hrs). Enroute see the monuments and temples of the Ahom Dynasty at Sivasagar. Reach Kaziranga late in the afternoon. 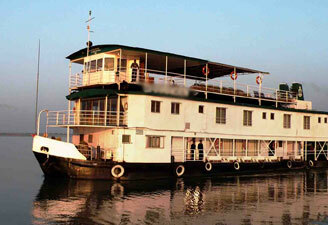 Overnight at BonHabi lodge or similar.Sivsagar was once the capital of the Ahom Kings. The Shans who came from Thailand through Northern Myanmar to this area in early 13th century, ruled for 600 years. The Siva Temple, built by the Ahoms, situated here is believed to be the tallest of all existing Hindu temples. The ruins of the Ahom palaces and monuments dot the landscape around this historical town. Centuries, before the arrival of the British, this part of the world was controlled by a number of tribal chieftains. In the town of Sivasagar, one can still see the remaining well preserved relics. Palaces, tanks, forts, places of worship and burial sites (vaults) at Charaideo present the richness of this highly evolved and advanced civilization. The largest and the oldest amphi-theatre of Asia (Rang Ghar) is also another remarkable landmark in the history of Sivasagar. The Tai- Ahom Museum of Sivsagar contains the some of the relics of the Ahom period, like – swords, clothes, manuscripts and sundry artefacts. Early morning take an elephant safari in the central range of the park followed by a jeep safari after breakfast to the western range of the park. Post Lunch visit the eastern range of the park. Evening at leisure. Overnight at the lodge.Kaziranga national Park - is a World Heritage Site, where more than 75% of the world’s total population of the great Indian One horned Rhinoceros can be found. It lies on the southern bank of the Brahmaputra River and is one of the oldest parks of Assam. Besides rhinos, the Asiatic Water Buffalo numbering over 1200, elephants over 1000, tigers more than 81, Swamp deer, Barking deer and Hog deer can be seen. About 400 species of birds are found in the park. N.B: - National Parks of this region remains open from mid November till end April only. After breakfast depart for Guwahati (240kms/5hrs). Visit the Tea Auction Centre – the largest auction center for tea. Visit a Tea Brokerage Firm to know more about tea tasting and its quality. Overnight at Hotel Landmark.Guwahati, the capital city of Assam situated on the south bank of river Brahmaputra. It has the world’s largest tea auction centre, is also the gateway to the north-eastern region of India. Guwahati is famous for several temples including Kamakhya; all of them are dates back to the Vedic and Puranic times.